I saw some homeschool blogging friends were participating in the 2013 Ultimate Blog Party and decided to join in. The ultimate blog party is simply an online party where you can make new friends without leaving the comfort of your sofa. Let me introduce myself for those that don't already know me. My name is Kathy and Kathys Cluttered Mind is our family's homeschool blog. Here we share all about our homeschool journey both the ups and downs. We also share homeschool product reviews, fun fieldtrip adventures, crafty projects, free homeschool resources and more. April 29th will mark my 2 year blogging anniversary! I am very happily married to my wonderful husband who I married on my 19th birthday in 2000! We have two children who are 17 months apart. Gwyndolyn is our compassionate, artistic, animal loving daughter. 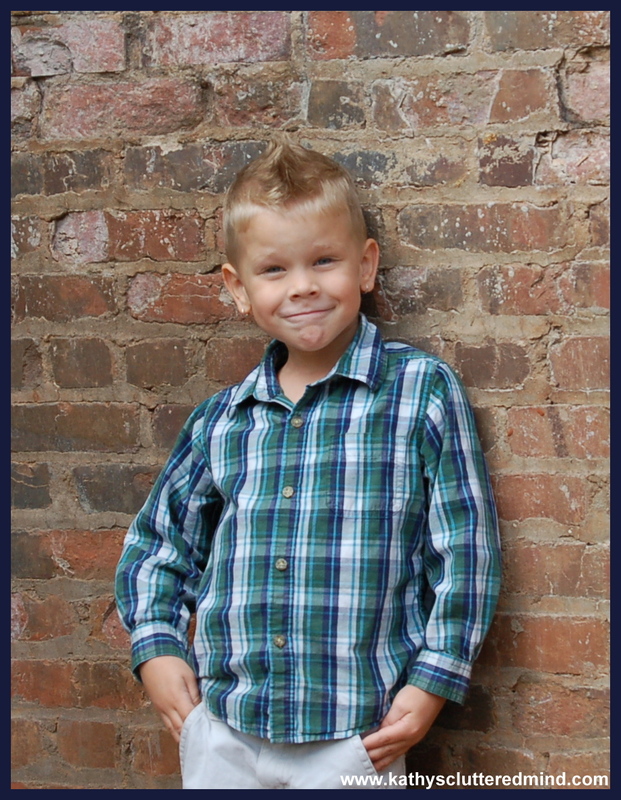 Rowyn is our silly, rambunctiousness, Lego and Star Wars loving son. We live North of the hustling and bustling city of Atlanta, GA.
Rowyn almost 6 years old. 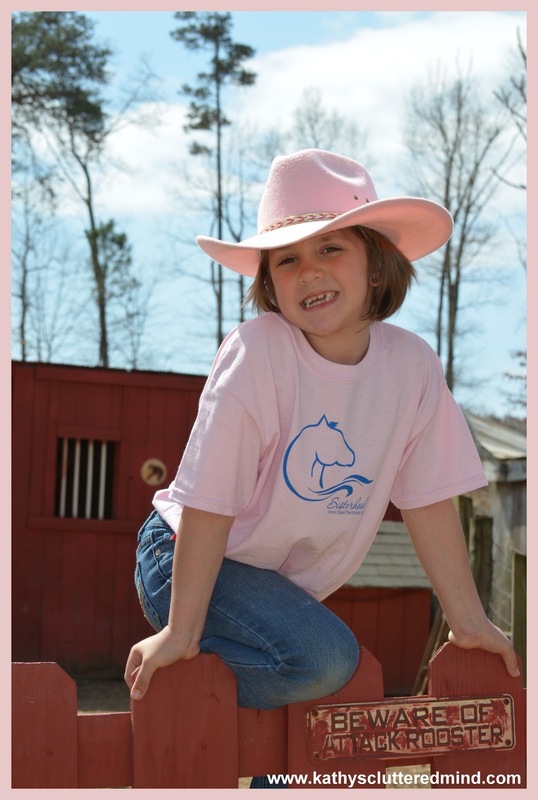 We began our homeschool journey in 2011 (prior to that I worked outside the home full-time). I have to admit homeschooling is the hardest job I have ever had. We have had many rough days. Days when I just want to give up. But there have also been amazing days. Days when I know we have made the right choice in homeschooling our children. My heart melted when I heard my daughter read a book all by herself for the first time. And when my son wrote his name for the first time I had tears in my eyes. We are very eclectic, delight-directed homeschoolers. We are always on the search for a new adventure. We love the outdoors and you can often find us on a nature walk writing and drawing in nature journals or on the search of another Geocache. 1) I love to blog. Yes blogging is a hobby for me. When I was in Junior High I wanted to be a journalist until a teacher told me I couldn't write. Well I guess my dream to write is coming true thanks to this blog. 2) I enjoy scrapbooking...even though I haven't had much time to do it lately. 3) I love watching movies. Want to know what my husband did just about every night when we were dating? Actually what we still do just about every night? We watch movies. We love watching flicks of any kind: drama, action, suspense, horror, girly, animated...you name it we have probably seen it. 4) I manage social media for A+ TutorSoft a homeschool math company. 5) I love traveling and there was a point in my life that I wanted to be a flight attendant or work on a cruise ship. 6) My husband is the first man I ever dated and we only dated 6 months before getting married. 7) I had surgery at the age of 20 to fix a birth defect called Malrotation of the Small Intestine (basically my small intestine is in the wrong place). I had to be operated on by a pediatric surgeon at Hershey Medical Hospital. It was very odd that I had no intestinal issues as a child and had no effects of the defect until I reached 19 years of age. 8) Prior to becoming a stay at home mom I worked as a retail manager for 10+ years and an administrative assistant at a real estate school. I actually have my real estate license though it is currently inactive. 9) My favorite flower is the sunflower. And my favorite color is blue. 10) I have a strong Type A personality and also deal with OCD. I also oversee a couple Facebook groups: Homeschool Math and GA Homeschool Fieldtrips. And several Google + communities: Homeschool Math, Homeschool Giveaways, Homeschool FreeBEEs, Homeschool Product Reviews and Wildlife Wednesday. 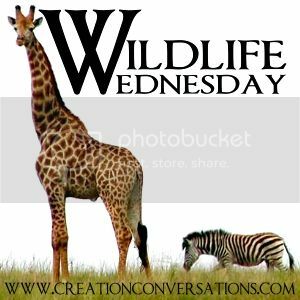 Each month myself and a couple of blogging friends have two great link ups where fellow bloggers can share their amazing posts - Wildlife Wednesday and FreeBEE Fridays. You can follow Kathys Cluttered Mind on Facebook, Google+, Twitter, and Pinterest. There is also an Android App for Kathys Cluttered Mind. Thanks for visiting our blog we are delighted to have you, we hope you stay a little longer and take a look around. Also be sure to visit the other bloggers participating in this party! Dropping by from the UBP13. I used to always want to be a flight attendant. How fun would that be? Kev and I love to travel, no kids at home but now we have a 1 yr old granddaughter who we can't get over how fast she is growing. Looks like you have a blast homeschooling! Hi Kathy - you sound very busy..I love the names of both your kids! They are so sweet. The thing about husbands is when you know, you just know right? I knew mine 3 months before moving back from out of state to live with him, we were married within the next year. I hope you have a great time partying! Hi! I'm enjoying checking out your blog - dropping by from the UBP13. Hopping over from UBP13. I homeschooled for 10 yrs, but now mine are all grown up. I think we've chatted on the #hsbloggers chat on Tuesdays. I also like to cook, craft & write.